There are a lot of moving parts when you hire a team to carry out your wedding day. A couple spends time pouring over the venue staffs, florists, bakers, caters, musicians, Djs… the list goes on and on. Most of the time all these vendors have most likely worked together or at the least know of each other’s work. Its hard to be in the small town industry of weddings without bumping into others in a local market. But there is almost always one vendor that is hired as an after thought. 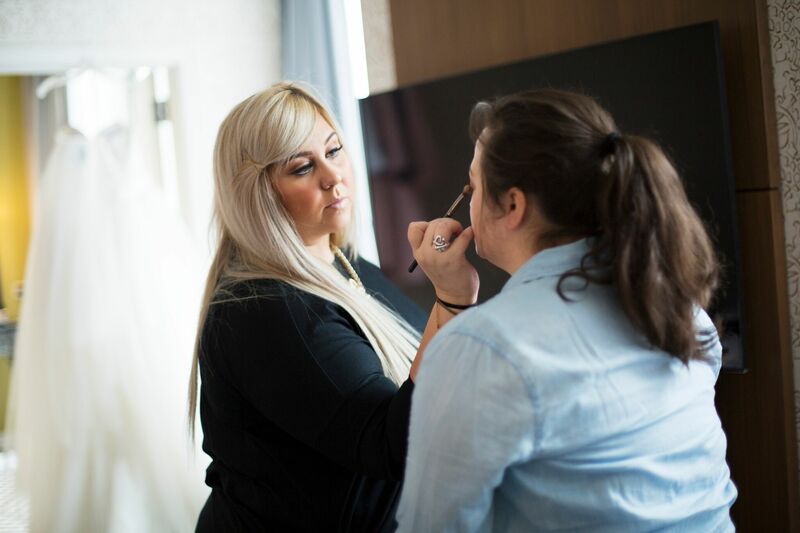 An important person that is going to spend almost the entire day with you, have to work closely with you and stick to a timeline created by someone on the vendor roster, whether its the venue team, the photographer or your planner. This particular person could make your day run smooth and perfectly, or this person has the opportunity to spoil the timeline and feel of the day. Someone that important couldn’t be just hired as an afterthought?! Or could they? Most brides just don’t think of the full scope of getting ready on their big day. I mean of course you take multiple trips searching for that perfect gown, perfect accessories, and perfect bridesmaid dresses. Maybe they have even spent hours pouring over pinterest looking at different hair styles, and maybe(maybe) makeup looks as well. They have spoke at length to the photographer about what time he should arrive, what pictures are must haves, ones of the bridesmaids sipping mimosas and the back of the specialty robe that says BRIDE in cute rhinestones across the back. But there is a big logistics question that is never brought to the Bride’s mind, and it never fails, I’m always surprised when talking to my brides that I’m bringing it to their attention. YOU HAVE TO ACTUALLY GET READY! You have to actually get ready. You have to think, am I getting myself ready? If the answer is no, or I don’t think so…you are going to have to start looking for a professional. So let me get back to my point. Your secret wedding planner. A secret weapon. An expert in his or her field that has also earned a master’s in wedding planning by accident. Of course a bride forgets, there is so many small things, and so much to remember. And of course, any of the amazing vendors the couple spent hours choosing to hire could answer these questions, find these things, but one problem; they are not there! They are not with you, they are off working so hard for you, creating that vision you have for this amazing party you spent so long planning. But you know who is there? Don’t let your “secret planner”, your “personal helper”, your “secret weapon”, be an after thought. Ask the right questions when you contact that MUA, or MUHA, or stylist. Make sure they have experience with weddings. Ask how many weddings they have done? Do they travel? Don’t exclude them from your day of planning. Make sure to include them in vendor emails and on timelines. This is a part of YOUR team! Let them add their value to your day. Choose someone who will make your day, from the moment you arrive until the moment they leave, a fun and relaxing time.And if you get someone like this don’t forget to leave them a awesome review! Want a makeup artist and hair stylist that can be your SECRET WEAPON too? Make an appointment today!